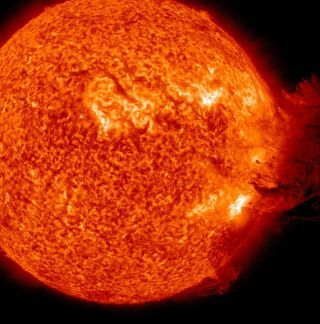 The sun unleashed a massive solar storm today (June 7) in a dazzling eruption that kicked up a vast cloud of magnetic plasma that appeared to rain back down over half of the sun's entire surface, NASA scientists say. The solar storm hit its peak at about 2:41 a.m. EDT (0641 GMT), but the actual flare extended over a three-hour period, said C. Alex Young, a solar astrophysicist at NASA's Goddard Space Flight Center who runs a website called The Sun Today, in a video describing the event. NASA's Solar Dynamics Observatory spacecraft caught high-definition video of the flare in different wavelengths. The event registered as a Class M-2 solar flare, which is a medium-class sun storm that should not pose a danger to satellites or infrastructure on Earth. An alert by the NOAA-operated Space Weather Prediction Center stated that the solar flare could create a strong geomagnetic storm on Wednesday (June 9) from the event's coronal mass ejection (CME), an explosion of charged particles triggered by the flare. Geomagnetic storms can lead to stronger than normal displays of Earth's auroras, also known as the northern and southern lights. "It's nothing we really have to worry about," Young said in his video. "It's just really, really beautiful." The coronal mass ejection is directed at Earth and moving at about 3.1 million mph (5 million kph), SDO mission scientists said in a statement. "Due to its angle, however, effects on Earth should be fairly small. Nevertheless, it may generate space weather effects here on Earth in a few days," they added. In the SDO videos, the solar flare erupts from the lower right of the sun and triggers the intense coronal mass ejection, which blows plasma and particles high up into the sun's corona — its outer atmosphere — with some raining back down. SDO mission scientists said the flare kicked up relatively cool gas and material. "It is somewhat unique because at many places in the eruption there seems to be even cooler material —at temperatures less than 80,000 Kelvin," SDO scientists explained. A temperature of 80,000 Kelvin is about 143,540 degrees Fahrenheit (nearly 79,727 degrees Celsius). The sun's corona typically has temperatures ranging from 900,000 degrees F (500,000 degrees C) to 10.8 million degrees F (6 million degrees C). It can reach tens of millions of degrees when a solar flare occurs. The sun is currently going through an active period in it is 11-year solar weather cycle. The current cycle is called solar cycle 24. Several NASA spacecraft are keeping constant watch on the sun for flares and CMEs, and serve as an early-warning system for major space weather events.